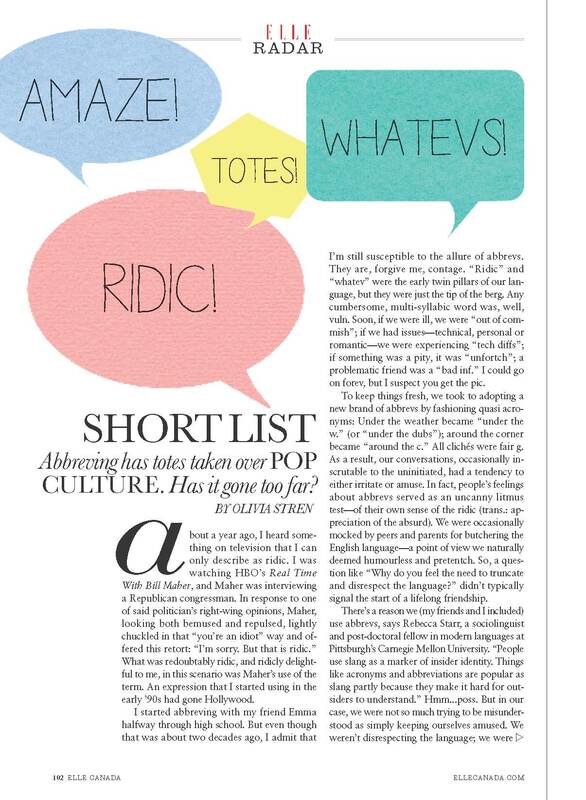 Abbreving has totes taken over pop culture. Has it gone too far? About a year ago, I heard something on television that I can only describe as ridic. I was watching HBO’s Real Time With Bill Maher, and Maher was interviewing a Republican congressman. In response to one of said politician’s right-wing opinions, Maher, looking both bemused and repulsed, lightly chuckled in that “you’re an idiot” way and offered this retort: “I’m sorry. But that is ridic.” What was redoubtably ridic, and ridicly delightful to me, in this scenario was Maher’s use of the term. An expression that I started using in the early ’90s had gone Hollywood. I started abbreving with my friend Emma halfway through high school. But even though that was about two decades ago, I admit I’m still susceptible to the allure of abbrevs. They are, forgive me, contage. “Ridic” and “whatev” were the early twin pillars of our language, but they were just the tip of the berg. Any cumbersome, multi-syllabic word was, well, vuln. Soon, if we were ill, we were “out of commish”; if we had issues—technical, personal or romantic—we were experiencing “tech diffs”; if something was a pity, it was “unfortch”; a problematic friend was a “bad inf.” I could go on forev, but I suspect you get the pic. To keep things fresh, we took to adopting a new brand of abbrevs by fashioning quasi acronyms: Under the weather became “under the w.” (or “under the dubs”); around the corner became “around the c.” All clichés were fair g. As a result, our conversations, occasionally inscrutable to the uninitiated, had a tendency to either irritate or amuse. In fact, people’s feelings about abbrevs served as an uncanny litmus test—of their own sense of the ridic (trans. : appreciation of the absurd). We were occasionally mocked by peers and parents for butchering the English language—a point of view we naturally deemed humourless and pretentch. So, a question like “Why do you feel the need to truncate and disrespect the language?” didn’t typically signal the start of a lifelong friendship. There’s a reason we (my friends and I included) use abbrevs, says Rebecca Starr, a sociolinguist and post-doctoral fellow in modern languages at Pittsburgh’s Carnegie Mellon University. “People use slang as a marker of insider identity. Things like acronyms and abbreviations are popular as slang partly because they make it hard for outsiders to understand.” Hmm...poss. But in our case, we were not so much trying to be misunderstood as simply keeping ourselves amused. We weren’t disrespecting the language; we were playing with it. If boredom was the ultimate evil in our adolescent universe, abbrevs seemed an easy rebuke against conversational ennui. If we were powerless against boredom at large, at least we could undermine the verbal variety. “You made ridic happen globally!” a friend emailed me recently when he learned that “ridic”—along with “vajazzle” and “lolz”—had been admitted into Oxford Dictionaries Online. Wish I could take the cred. But it turns out that abbrevs (also dubbed “clipping slang”) have been in and out of fashion over the past 100 years. Even if words and acronyms like “totes” and “btw” are having a moment, it seems that abbrevs peaked in popularity in the 1920s: British admiral Lord John Fisher used “OMG” in a 1917 letter to Winston Churchill, and British humorist P. G. Wodehouse littered his books with abbrevs of all stripes. (They are, btw, spoken by the ineffectual, well-brined and imbecilic bourgeoisie, but that’s beside the p.) “In the United Kingdom, abbrevs have a somewhat posh association,” proposes Starr. In North America, their popularity is more democratic—and arbitrary. Unlike the hemline, whose ever-shifting length reflects the cultural and economic air du temps, the trimming of language is more haphazard, believes Starr. “Abbrevs make the speaker sound relaxed and casual, which makes him or her seem cool,” she says. “So, in any era in which seeming relaxed and casual is popular for young people [which has been the case for the past 100 years], abbrevs could potentially catch on.” In an astonishingly thorough but by no means abbreviated email, Starr explained to me the various kinds of legitimate abbrevs. I felt strangely rattled by her tutorial—like she was educating Newton on why fruits fall from trees. Like, I’ve been abbreving since I was practically in diaps (or at least since I was in a Patagonia fleece)—I got this one. And now, it seems, so has the rest of the world. Oprah called Fergie “gorg” on OWN; “audish” made its debut on SNL. Abbrevs are everywhere; they’re the Kardashians of the verbal world. In short: It’s gotten ridic. Their promiscuity is bordering dangerously on the vulg. Under the circs, I feel that I may need to start abbreving my use of abbrevs. I will start tomorrow. Def. I will no longer spare a syllable. It will be the dawn of a new e. It will be totes amaze.